The Humpback Whale is one of the most recognized of them all due to the hump over the dorsal fin. They have an average size of 52 feet long. There is quite a difference in their sizes depending on location when it comes to weight. Those that live in cooler regions can be up to 40 tons whiles those in the tropical areas are about 30 tons. They have a very long tail that can be up to a third of body length. They also have huge flippers that are often referred to as wings do to the position of them as they leap out of the water. An interesting fact is that the heart has four chambers. These are enjoyable whales to watch. They tend to do plenty of great moves and flips in the air effortlessly as they rise to the surface for air. As a result they are often trained when it captivity to do more advanced forms of acrobatics. Another characteristic is to lift up the head and not the rest of the body. This gives the appearance that they are very curious about their surroundings. The Humpback Whale is very social, and sings louder than most of the others out there. Their songs can be heard for several miles which is amazing. They form very small but intimate groups. They tend to stay within the same groups for most of their lives too. The Humpback Whale has a more detailed feeding system than any other whale out there. They feature grooves on the throat that allow it to open up and to expand when they eat. This way they can take in huge amounts of water. The filtering system keeps the food and pushes the water out. They are seasonal feeders and then they cut down to almost nothing when they migrate. They will consume from 3,000 pounds of food daily if it is available. They have a very detailed system within their pod to help them with hunting for food. This is called bubble net feeding and is interesting to watch. They create a circle under the water with their bodies and then blow bubbles. The bubbles are able to trap the small sea life that they would like to consume. This mass of prey will rise up and then the Humpback Whales can eat it with ease. This is very helpful since they don’t swim very fast, up to 9 miles per hour, but they can reach up to 16 miles per hour at times. 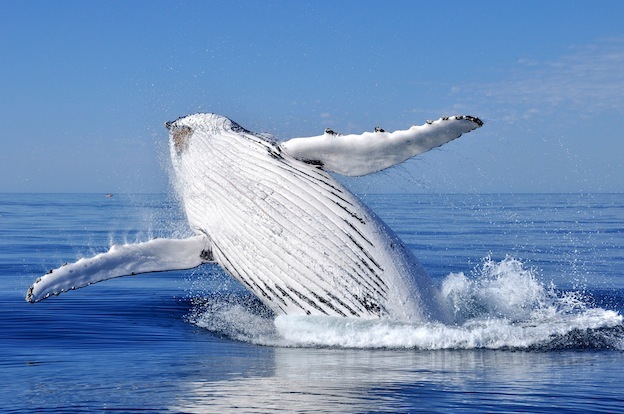 You will generally find Humpback Whales at the surface of the ocean waters. They migrate a very long distance and since they move very slow it takes them a while to complete the process. Even though they move slowly, they do move steadily towards their destination with almost no time to stop and rest. After conception it can be close to 11.5 months before the calf is born. Caring for these calves can be hard though due to them consuming many gallons of milk every day. There isn’t very much really known about the mating process for these whales other than the deep, eerie songs that the males will belt out for courting process of it. Sadly, there are very few Humpback Whales left. It is estimated that there can’t be more than 15,000 of them in the world. Conservation efforts have been initiated to help them to climb back up there. One can live up to 50 years in the wild if they have the umbrella of protection that they need.